It is absolutely vital that prior to Bernadette Denby carrying out any work on your behalf that you have your finance for the purchase of the property in place, where a mortgage is required you need to have your Letter of Offer from the bank, which should then be passed on to your solicitor so that they can quickly process the conveyance of the property once a sale has been agreed. If you are a cash buyer you should have proof of funds available because it will be required when submitting final offers on the purchase of the property. Bernadette Denby will need proof of funds or a copy of your Letter of Offer from the bank before negotiating on your behalf on any property. In Ireland, every property service provider must be licenced by the Property Services Regulatory Authority and in order to obtain that licence the applicant must be qualified, must have adequate insurance, be tax compliant and adhere to a Code of Ethics. They must also have a Contract of Engagement with every person to whom they provide a property service, and that contract is prescribed by the PSRA, a copy of which will be provided. 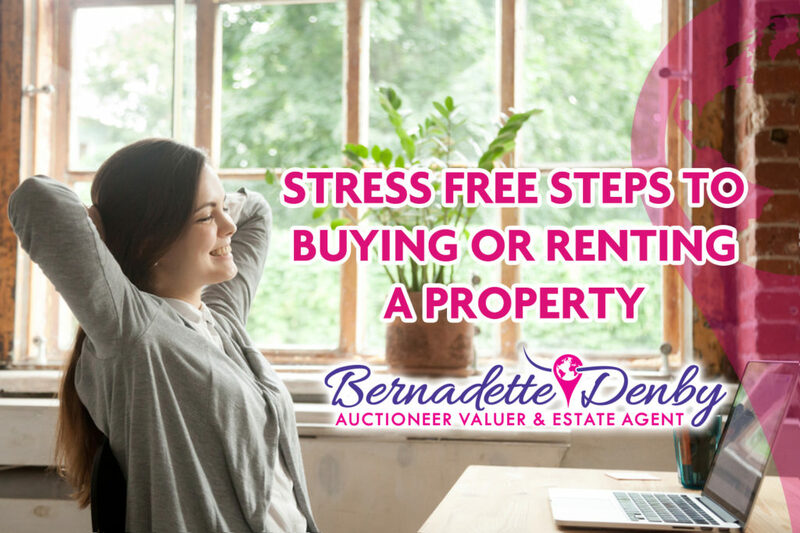 Therefore, when you register your interest in purchasing a property through Bernadette Denby Auctioneer Valuer & Estate, you must sign this contract. The contract is designed to protect you and Bernadette Denby Auctioneer Valuer & Estate Agent. When registering your interest we need find out exactly what you are looking for and more importantly why it is that you are looking to purchase a property. For investors we need to know what yield they expect from their investment and what their long-term investment planning is. This will help Bernadette Denby to advise you in relation to the type and location of property to buy. It will also guide us in relation to finding exactly the right property for you. You will be required to pay a non-refundable briefing fee of €750.00 when signing a contract with Bernadette Denby. Agreements are valid for a period of three months which can be then be reviewed by either party should more time be requiredOnce a purchase has been negotiated and you have placed a booking deposit on the property the balance of the fee becomes due. Instructing a solicitor is a very important task when buying a piece of property. The difference between having a good and bad solicitor could mean the deal stalling and you having to wait to get those keys and could even make the deal fall through. Sometimes finding the cheapest is not always the best option and even the more expensive solicitors are not the best option. Bernadette Denby has local knowledge and experience with quality approved solicitors that we would be happy to recommend. Bernadette Denby is a Certified International Property Specialist (CIPS) and a member of National Association of Realtors (NAR). This network gives Bernadette a fantastic advantage to source property not only locally but nationally and internationally. Buying the property and making offers. Making offers can always be the most frustrating part of buying of a property. Getting into bidding wars and wondering if you are paying too much for the property. Having a property professional working for you with 20 years knowledge and experience can only reassure you that you are being guided in the right direction. When your bid is accepted you are required to pay a booking deposit. Please remember this booking deposit is fully refundable up until you sign legal contracts at which point it forms part of the purchase price. This point in the purchase is generally referred to as “Sale Agreed”. Making sure you’re soon to be home is structurally sound is most importance from a financial investment perspective. We have a list of quality approved surveyors with proven track records that will be able to give you an honest assessment of the structure of the home. The Vendor’s Solicitor issues contracts to the purchaser’s solicitor. When your solicitor is happy that queries have been responded to, ensuring that your surveyor and valuer have carried out their reports and your funds are in place they will ask you to sign the contracts and generally pay 10% of the purchaser price. That contract you have signed will become legally binding when the Vendor signs the same contract. Should either parties choose to withdraw from the purchase after the signing of contracts they would almost certainly pay major penalties. A closing date is usually agreed between the parties for the completion of the process. This is to allow sufficient time for funds to be transferred to the Vendor’s solicitor either. Generally, most funds are transferred online but sometimes cheque’s from lending institutions are issued which require time to clear in your solicitors account. Once the funds have cleared your solicitor will do their final queries and requisitions and transfer the balance of money due over to the vendor’s solicitor in order for the sale to close. The keys to your new property can give received from either the vendor’s solicitor or the agent acting for the sale. To find you a rental property? A charge of 100% of the month’s rent is the fee payable. Non-refundable briefing fee €300.00 plus VAT charged on signing of agreement.